The Bees is set in a hive and written in third person following the perspective of Flora 717, a sanitation worker bee. Living in this hive, if you are deformed, you are killed on sight and only the queen may breed, every bee has its calling and place. However, Flora turns out to be very different from the other bees. Even though she is born into the lowest caste and her life's entire focus is meant to be, "Accept, Obey, Serve" the Queen, she is somehow able to question, she is born with curiosity beyond her calling. Subsequently she is allowed to do more than merely sanitize the hive, she is also allowed to serve the Queen by feeding newborns in the royal nursery and then forage to collect pollen as well. Flora goes so far that she is able to serve the Queen herself, uncovering mysteries about the hive that are deeply philosophical and also very dangerous. The book's climactic conflict rises with Flora laying eggs herself. Her deepest desire (as well as instinct) to serve the hive and her Queen are overpowered by fierce maternal love. Her actions lead to devastating consequences, but they might be exactly what the hive needs in order to survive. 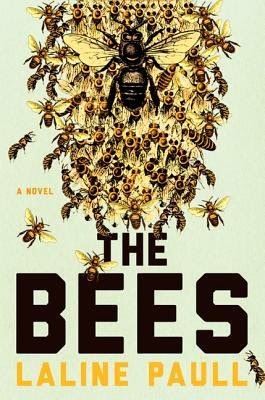 The Bees is very unique and imaginative, as well as unpredictable and thrilling. I loved Flora as a character, although at times she was hard to relate to simply because of the society she is brought up in and the instincts that the bees have for their duties. When she became more curious, questioning, and courageous, I found her a much more dynamic and interesting character. In short, when she was acting more human I also found the story more engaging. I think Laline Paull wrote some magnificent scenes by both personifying the bees in their natural habitat, making them seem very human, and also celebrating their differences, reminding the reader that they are insects, in vivid and beautiful language. However, when delving deep into a culture that is so different, and so inhuman, I was put off sometimes. I felt like maybe the book was getting too weird, disconnecting me from the plot and making me have a hard time finishing the book. When Paull became more creative with making the bees still seem like bees, emphasizing their natural instincts and how they communicate differently than humans, but also making them more human-like in emotions I was much more engaged and interested in the story. It was a brave novel to write, especially as a debut novel, and in most ways I think Paull did pull it off well. I loved the prologue and epilogue portions, grounding the story in the world in a captivating way. The end in general was strong and tied everything up, but the final major scene with the bees made me feel a bit uncomfortable. Again, I think it was simply because I found myself turning these characters into humans, but then was forcefully reminded that they are not human at all. The book was emotionally striking and somewhat disturbing as well. Overall I liked it, but I probably won't read it again. I recommend it to people who are very adventurous in their reading, those who are willing to read things that are outside of the box. I recommend a simple drink with this book, but maybe one you haven't thought of making before: a honey milkshake. It will bring a welcomed refreshment for the Summer, and is easy to make. This novel is somewhat simple in plot line, but has added kicks and a very different main flavor: that of being told from an uncommon perspective. I think that blending together milk, vanilla ice cream, and as much honey as your heart desires will provide the perfect drink to enjoy with this fascinating story.